Granite in My Blood: Tombstone Tuesday: Henry GALLUP, Jr.
Tombstone Tuesday: Henry GALLUP, Jr.
Henry GALLUP, Jr's gravestone does not indicate that he was a Junior, does it? The Italic script and the composition of the stone are a bad combination. It reads: In/Memory of/ Henry Gallup,/who died/Nov. 22. 1831/Aged 77 years. 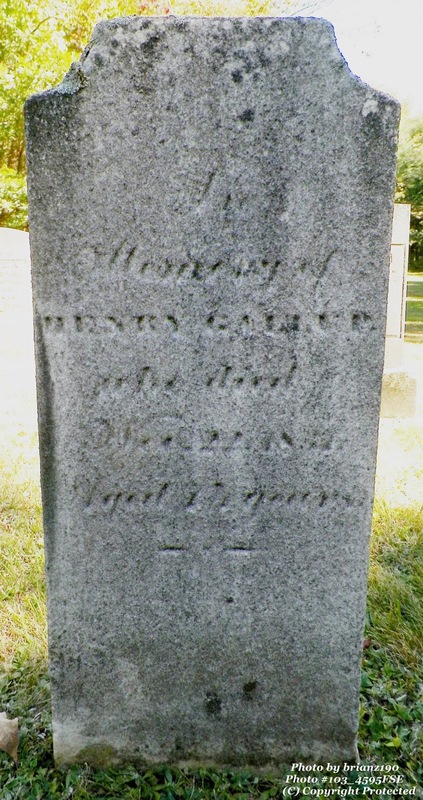 The Gallup (2009) Genealogy states that Henry, Jr. was born 17 Oct 1758 and died 22 Nov 1831, so he would be 73 when he died but it certainly does look like 77 to me. Henry married Desire Stanton on 17 Nov 1793 by Christopher Avery. They had 3 children.